Are you searching for Sunday school activities about friendship? Finding Sunday school activities about friendship has never been easier! The educational professionals and designers at Children's Worship Bulletins have done the hard work for you. Bulletins include a variety of word games, pictures, hidden pictures, codes, dot-to-dots, puzzles, mazes, seek-and-finds and more, making it easy to create engaging Sunday school activities for your class. Searching for Sunday school materials for children aged 3 to 12? 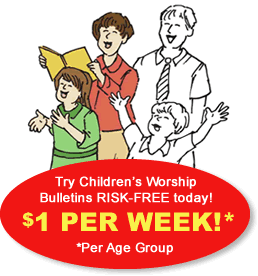 Children's Worship Bulletins are available for two age groups — ages 3-6 and ages 7-12. The content is Biblically based and theologically sound. Each bulletin helps children learn Scripture, not doctrine, making them appropriate for nearly every Sunday school classroom. Searching for Sunday school materials your children will love? We think you'll love Children's Worship Bulletins. To show you how easy it is to create Sunday school activities about friendship from a Children's Worship Bulletin, we've included two examples of activities in this short article. Print the "Jonathan sent a secret message to David" activity page from Children's Worship Bulletins website. Explain the activity to the children, "We're going to write a secret message to David ourselves. We'll use invisible ink." Distribute the activity page, a small amount of lemon juice in a disposable cup and a cotton swab to each child. Have each child draw a picture or write a message to David using the cotton swab and their invisible ink (i.e., lemon juice). While the secret messages are drying, have the children complete the "Jonathan sent a secret message to David" activity page. As each child finishes the activity page, use the hairdryer to heat the paper, revealing the secret message or picture. Read aloud 1 Samuel 20:1-42 to reinforce the lesson. Print the "When Saul noticed David was missing from dinner ..." activity page from the Children's Worship Bulletins website. Explain the object of the game, "The goal is to be the first team to find all of the words in the word search puzzle." Recite together 1 Samuel 20:1-42 to reinforce the lesson. Don't spend another frustrating hour searching for Sunday school activities about friendship. Find exactly what you need — by Scripture reference, topic or lectionary — with Children's Worship Bulletins. Sign up today for a 30-day Risk-Free trial. If you're not completely satisfied, cancel at the end of your trial and owe nothing. We're sure you'll love Children's Worship Bulletins. We offer memberships for just $4.99 a month per age group. Take advantage of our special new member offer and get the second age group for 50% off! See how easy it is to create Sunday school activities about friendship or any other topic. Sign up today!